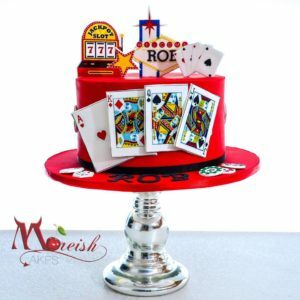 Monica Cavallaro, owner of Moreish Cakes, not only makes amazing cakes, but she was also a finalist in the TV hit The Great Australian Bake Off 2016. We had a chat with Monica about how she uses edible images in her work, application tips and in pushing her comfort zone to reach The Great Australian Bake Off Final. Topperoo: How do you decide when to use Edible Images in your bakes? Monica Cavallaro: I’ll look at the cake and see what elements need to be 3D. I then ask myself, “How can I make this look better than the client expected?” And then I ask “How can I make my life easier?” Quite often the answer is edible images. T: Do you have your own printer and if so did you find the printing process simple? MC: I don’t own my own printer as yet, but am considering it in 2017. Given the amount of images I’ve purchased this year, I could have bought one outright by now! I like the convenience and reliability of using other services. T: Do you have a preference to using rice paper or fondant icing to print on? MC: I personally prefer good quality icing sheets. Wafer paper and rice paper sheets were great when they first came out a few years ago, but I only use them for a few things now such as paper flowers. T: What do you like most about the Topperoo software? MC: Having multiple computers around the house, I love that I can log into my account no matter where I am and I can even work away from home. It’s really easy to use and it saves me hours of playing with the files to get it to be positioned correctly on the page. Before using the Topperoo software I would have to keep on printing the images to make sure they lined up on icing sheets before even sending to my printer. Now in a few clicks I know it’s right and just hit send. PLUS I can have different cupcake toppers on the one page, rather than have to order the multiple of the same image. 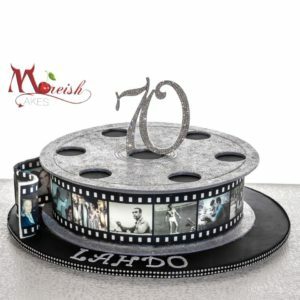 T: How about applying the images to your cakes, what was that process like and do you have any tips? Cupcakes: roll out a very thin layer of good quality fondant and using cutters, cut to the right shape for the image. Ensure the fondant is white as the image will show the colour underneath it. With the images on an icing sheet, pop them into the freezer for no more than 5 minutes before using. Always store sealed to prevent drying out and in a cold dark place as they don’t fade. If they are circular, invest in a round cutter. I have various sized Fiskar cutters which save me time and my hands! Alternatively, a round metal cutter on a firm surface pressed down and a little turn will do the trick. You also can cut with scissors but this takes forever! If the cost of Fiskar cutters is a concern, they can also be used to cut wafer paper to make fabulous flowers, so it’s a great investment for any cake decorator. Cake wraps: First, make sure what you have printed out goes all the way around the cake, OR print multiple sheets and make sure the images pattern lines up where the 2 images meet. Cover your cakes, or the where the image will go, with a thin but very smooth layer of white fondant. You can apply directly to white chocolate cakes or butter creamed cakes, but take care that image doesn’t run or bubble with the moisture. I personally prefer the perfect finish that white fondant delivers. Prepare your sheets then choose your adhesive. Use piping gel, sugar glue or just plain water. Whatever you choose, make sure it’s a very thin film, hardly damp will do, else you run the risk of damaging your images. Using a larger clean cake scraper, remove the image from the plastic backing and place on your cake. Edible images don’t like heat or moisture so ensure your hands are clean and dry. Using a cake smoother, run it over the image gently to ensure it’s all adhered. Air bubble? No problem, a simple prick with an acupuncture needle and a smoothing is all you need. Cake wraps are amazing and you can create incredible looking cakes with minimal work! T: What do you think the main benefits are to using edible images? MC: The main benefits in using edible images is the wow factor for minimal fuss. It’s cake decorating for the non expert too. It helps take a good decorator to great levels and a novice to looking professional. It’s the hours of time saved in creating perfect finished looks that really knock your clients out with just a tiny bit of knowledge and practice! I am a huge fan and highly recommend people to try them for themselves. T: What is the strangest or funniest cake you’ve ever made with edible images? MC: I have made so many cakes with edible images. From hygiene wipes, to champagne bottles to full on 3D Nutella jars to name but a few. Plus a HUGE array of wafer paper flowers too. The only limit is your imagination really. T: And we can’t go without asking you about The Great Australian Bake Off 2016. That must have been so exciting, but how would you describe it…..in a paragraph! MC: A short version of my experience is to say it was AWESOME! A fabulous uplifting experience to be surrounded by positive and supportive people. I can’t recommend enough that in life you attempt things outside your comfort zone and give things a shot. I would do it again in a heartbeat. I took on the challenge as I am limited due to a medical condition and wanted to test myself and my abilities. To show people, not matter what happens in life, you can pick yourself up, dust yourself off or find a way to still achieve your goals. Always try and push for better. 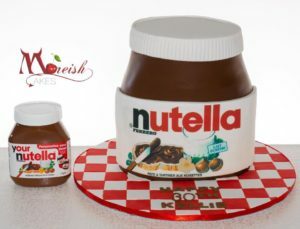 You can see more of Monica Cavallaro and her amazing bakes on her Facebook page, Instagram and at www.moreishcakes.com.au. Well Done again Monica – great achievement!